WASHINGTON, D.C. – Anxiety over foreign trade agreements in the industrial Midwest helped President Donald Trump win the White House two years ago. Now the anxious Washington political establishment is trying to figure out why middle class voters in places like Ohio were peeved. 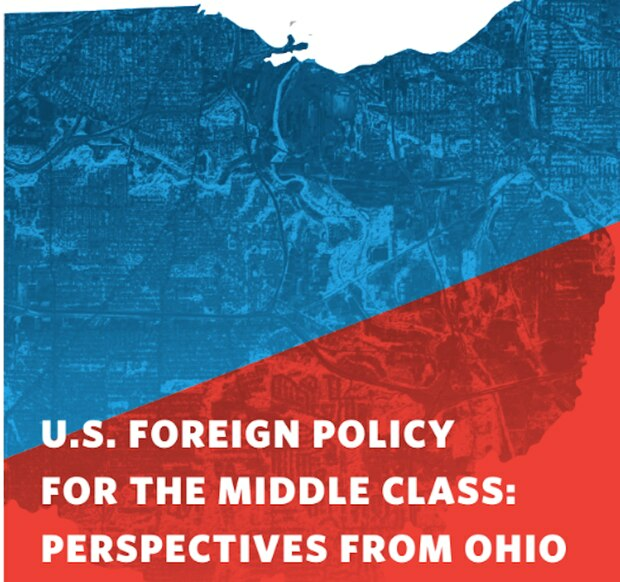 In an effort to help the nation’s policymakers grasp outside-the-beltway views on foreign policy, the Carnegie Endowment for International Peace unveiled a report on Thursday that examines how U.S. foreign policy has affected Ohio’s economy. The organization will also release state specific reports on Colorado and Nebraska, but decided to do Ohio’s first because of its status as a bellwether state, and its economic and political diversity. The report found that while the Ohio’s economy is growing and unemployment is falling, prosperity is uneven as smaller cities and towns struggle after major employers depart. Many of the available well-paid middle class jobs require education and skills the unemployed don’t have. No more than a third of the 750,000 well-paid manufacturing jobs that Ohio lost between 1969 and 2009 were lost because of trade, the report found, with factors like automation and competition with other states also playing a role. More of the trade-related job losses were due to Chinese imports than the North American Free Trade Agreement, which recently renegotiated by the Trump administration. Those affected by Chinese trade said they back Trump’s imposition of tariffs on Chinese imported goods, saying ”at least he’s doing something” about imbalances created by China’s model of state capitalism. Bolten noted that Trump’s election happened after he and unsuccessful Democratic presidential candidate Hillary Clinton tried to outdo one another in opposing the Trans Pacific Partnership pact that Trump rejected upon his election. He said longtime open trade backers like himself need “to understand what is going on and not try to preach the gospel of the beltway to the uninitiated.” Instead, he said policy makers should try to understand the interests of the uninitiated. Another former White House chief of staff who participated in the panel to unveil the report – the Obama administration’s Denis McDonough – said the United States does fewer labor market interventions , such as wage supports and assistance with child care, than other economically developed countries. Not investing in programs and projects to mitigate fallout from larger trends like automation and artificial intelligence will make matters worse, he said. The study, which was performed in conjunction with Ohio State University’s John Glenn College of Public Affairs, included speaking with a bipartisan array of former senior policy makers in Ohio and workers and business operators in Cleveland, Coshocton, Dayton, Lima and Marion. In Cleveland, it found that employment in education and health services have supplanted manufacturing as the area’s dominant sector. While health care jobs aren’t likely to move overseas, the study observed that many of the fastest growing jobs in that sector – like home health aides – don’t pay enough money to be gateway jobs to the middle class. A Cleveland-area business representative said he was surprised and “baffled by Trump’s tariffs on Canadian steel and aluminum, which he believed made no sense in an area like Northeast Ohio where product supply chains are intertwined with Canada. A former top executive at a global firm said a Chinese competitor selling a copy of one of his company’s parts at a price well below its raw materials costs forced his company to close the division making the disputed part because it had lost all its customers by the time the Federal Trade Commission ruled on its complaint. Several Ohioans who attended the unveiling discussed developments in their communities, with Coshocton Port Authority Executive Director Tiffany Swigert saying it’s hard for communities like hers to get economic development grants, and expressing hope that a stalled highway between Columbus and Pittsburgh will be completed. Dave Claborn, director of Development and Community Relations at Ohio State’s Marion campus, said foreign tariffs help some businesses in his community and hurt others. He asked whether the tariffs will hurt foreign direct investments that have helped communities like Marion. “Is there a balancing act, or is finesse not a word that works anymore in Washington,” asked Claborn. “This administration has been bad at the finesse game, to say the least, but it seems to be not impossible that they or a successor administration can arrive at a place where we are restoring ourselves to a leadership role in opening up the national trading system while confronting the Chinese on the policies that are threatening that system,” Bolten replied.